How Do You Know When You're Doing What the Savior Wants You To Do? Is there a sure way to know what you're doing is what the Savior would have you do? 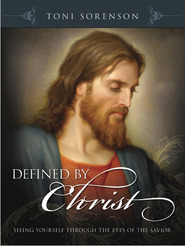 Best-selling author Toni Sorenson's inspiring series, including Defined by Christ and Refined by Christ, has motivated audiences to assess and strengthen their personal relationship with Jesus Christ. Now, the author invited you to be aligned with Christ and learn to turn mind, body, and will to the Savior and to claim the peace that comes from the assurance that you're truly in tune with heaven. For those struggling to strengthen their relationship with Jesus and for all who are striving to withstand mortality's feelings of unworthiness and hopelessness, this volume provides a simple, scripturally rich roadmap intended to lead you on a joyous journey of self-examination—to assess your own spiritual alignment, to reroute when necessary, and to come to know the love of the Savior—not just when you reach your desired destination but along every step of the way. Audiobook Runtime Approximately 6 hrs. An inspiring LDS book for those looking to do some spiritual assessing. ALIGNED WITH CHRIST is full of stories, object lessons, and principles to help each individual asses their relationship with Christ. It's not a book about perfection, but about being aware of one is and working toward being completely aligned with Christ, just as the title suggests. An inspiring and honest look to aid spiritual self-assessment, mostly gearing to members of The Church of Jesus Christ of Latter-Day Saints. I enjoyed reading through this. It definitely made me think and do some self-assessment. I liked all the different stories and ways she applied different concepts with real-world experiences or things, making it easy to relate to or understand her point. The writing style was also easy to understand. I also appreciated that she covered all aspects of life, the physical and mental as well as the spiritual. I did want a little bit better organization for her thoughts with maybe some pictures or quotes in the side margins to break up the text, but overall there are a lot of good concepts here and plenty of little nuggets of spiritual wisdom. In the end, was it what I wished for? An enjoyable book that delivers spiritual insight and hopefully helps in making our lives more closely aligned with Christ. This is a book I definitely needed at this time in my life, when it's so easy to get caught up in the busyness of daily life and neglect my personal spiritual growth journey. I loved the attitude of hope and encouragement the author shares, and her words are perfect for those with serious struggles as well as those who need minor course corrections- basically everyone! I appreciated that there are so many examples from the scriptures- both the Bible and The Book of Mormon- that the author uses to make personal connections to ourselves. She uses real life examples as well, and I felt like this was an easy book to read while providing depth and thought-provoking insights. Quotes from modern day prophets and literary giants such as Leo Tolstoy were also shared that brought inspiration and light. There were so many passages to highlight and this is a resource I plan to turn to again and share with my friends and family. I felt the Spirit as I read and it encouraged me to increase my efforts to grow closer to my Savior and seek God's will, and look forward to the blessings that are promised as I do so. Highly recommend!! !